The single most important trend in investing today is the trend towards passive, low-cost index fund investing. Legendary investor, John Bogle founded the first index fund in 1975 with $11 million dollars. Today, that Vanguard 500 Index Fund (VFINX) has over $500 billion dollars under management. The Vanguard Group, John Bogle’s investment company, is now one of the largest investment companies in the world. They have over $4 Trillion in assets under management. Two-thirds of that is in funds or ETFs that track an index. How had Vanguard become so popular over the last 40 years? They keep your investing costs low, so you stick with them. 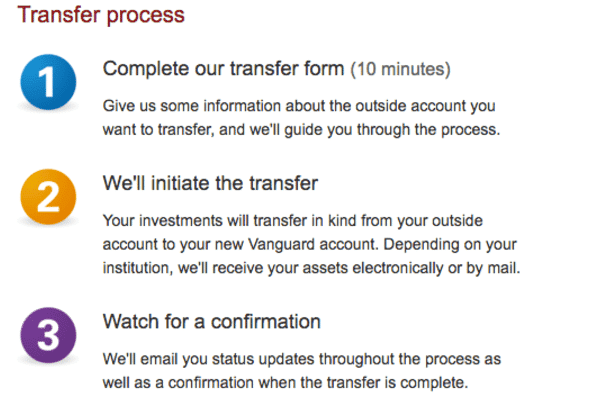 If you're interested in opening an account at Vanguard, here's what you need to know. Vanguard is a full-service discount brokerage firm, but the company specializes in no-load, low-cost mutual funds and ETFs. You can trade stocks, options and more, but the Vanguard website doesn’t make it easy. Active traders will want to put a hard pass on Vanguard. I’ve personally had an account at Vanguard for several years, but I hate the Vanguard website. Every time I log into the website I’m tempted to move my money to Fidelity or TD Ameritrade. However, I stick around because Vanguard makes it cheap and easy to invest, and I don’t need to do tax loss harvesting in my retirement accounts. Vanguard excels in helping people open new accounts. In particular, rolling over a retirement or after tax brokerage account is a pain-free process. Plus, Vanguard completes the rollover in a tax-efficient manner which keeps money in your pocket. The whole account opening/rollover process involves a series of questions written in plain English. Once Vanguard figures out what you need to do, they give you the appropriate forms, and complete the account rollover for you. If you’re opening an account with funds from your bank account, you can log in to Vanguard’s personal investor page, and choose the type of account you want to open. From there, you’ll connect to your bank account, and transfer funds. The whole process takes about 10-15 minutes. After that, it takes 2-3 business days for your funds to settle. Vanguard makes it easy to open any type of investing account you can imagine. This feature came in handy when I decided to open a SEP-IRA at the last minute one year. I managed to open the account the day before taxes were due. Vanguard has over 100 mutual funds and over 50 ETFs. You can buy and sell Vanguard funds at no cost. On average the expense ratios on Vanguard funds are among the lowest. These days, Vanguard, Charles Schwab, Fidelity, and the iShares from BlackRock fight for the lowest expense ratios on common indexes. No matter what, you can feel confident that you’ll pay very low fees on your mutual funds or ETFs. Even Vanguard’s actively managed funds have low fees relative to their counterparts. Vanguard does not charge a transaction fee if you want to buy or sell mutual funds from companies outside of the Vanguard group, but they do charge for stock and ETF purchases. Most investors will pay high prices for these trades which means that indivi﻿dual stock investors should stay away from Vanguard. The fee schedule for stocks, ETFs and options is below. Vanguard does not have any account minimum requirements. However, to start investing in mutual funds, you’ll usually need at least $3,000. In some cases, Vanguard lowered the barrier of entry down to $1000. If you’re just getting started, you don’t need to despair about these minimums. Vanguard allows account holders to buy just one share of a Vanguard ETF. As a result, you can start investing in a well-diversified portfolio for just a few hundred dollars. Unlike other full-service brokerages, Vanguard has clunky research and analysis tools. You can see a few portfolio insights from Vanguard’s portfolio watch feature. However, you can’t track your portfolio against an ideal asset allocation. Vanguard’s best research is in PDF files that are tough to search. In keeping with the company’s commitment to passive investing, most of the research falls into the category of “timeless.” That means that the information you find won’t necessarily influence your portfolio today or any time soon. As Vanguard continues to grow, we’re hard pressed to say it’s best days are behind it. Vanguard’s low cost promise means that investor dollars will continue to pour in for the foreseeable future. However, savvy investors can get the tools they want and the expense ratios they want too. If you already have an account at Vanguard, I wouldn’t bother changing it. On the other hand, if you’re looking for a new account, consider some of the other options that I’ve mentioned. What do you think of Vanguard? Are you currently using a discount brokerage firm? Vanguard is a leader in low cost investing, and they have a lot of options available to help investors achieve that. The only thing lacking is that their website and app aren’t the easiest to use.